One Friday afternoon last September, the students of Creativity, Innovation and Design (CID) assembled in the “Cage,” a room in the basement of Shadek-Fackenthal Library at Franklin & Marshall College. It’s not a typical course. Co-taught by six faculty and staff, the concept of CID sprung from the January 2017 campus symposium on creativity and innovation. In summer 2017, five professors, Etienne Gagnon (physics), Dan Ardia (biology), Kerry Sherin Wright (English), Bryan Stinchfield (business), and Dirk Eitzen (film), along with Teb Locke (director of instructional and emerging technologies), attended Stanford School of Design Thinking to learn how to teach ideation. At “d.school,” as it’s called, the instructors learned to facilitate creativity, focus on the importance of doing, and came up with ideas for projects. 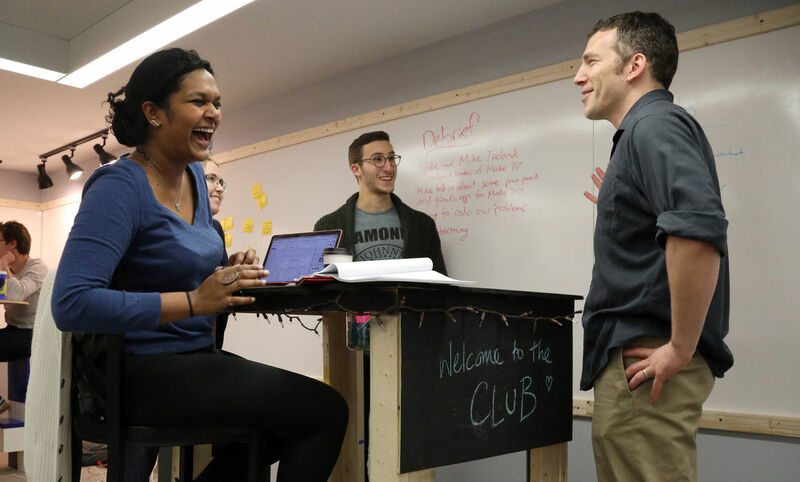 Throughout the semester, the class of 18 students split into six groups, each working with a nonprofit community partner to identify and test ideas. They followed prescribed design-thinking methods that generated solutions to the problems faced by each organization. One group worked with Modern Art, an art and design studio that offers community events and activities. “Modern Art believes habitual behavior is the antithesis to community engagement,” said Lauren Matt, a senior from Lafayette Hill, Pa.
Matt’s group aimed to break people of their habits through shock. They transformed a stationary bike into a Modern Mobile Public Art Generator, which currently functions as a pedal-powered charging station for cell phones. Lancaster General Health wanted to find a way to entice millennials to sign up for health care. The students came up with an idea for a Netflix-inspired monthly subscription application to instantly chat with doctors and skip lines at urgent care for non-acute illnesses. The app would allow each user to upload his or her medical history so doctors could provide a holistic approach. “These initiatives help to create a more vibrant ecosystem at F&M, where experimentation in the classroom and connection with the community are supported. Just as we want our students to take risks and try new things, so, too, do we want our faculty and staff to do the same. This is all necessary to keep spreading a culture of creativity at F&M." 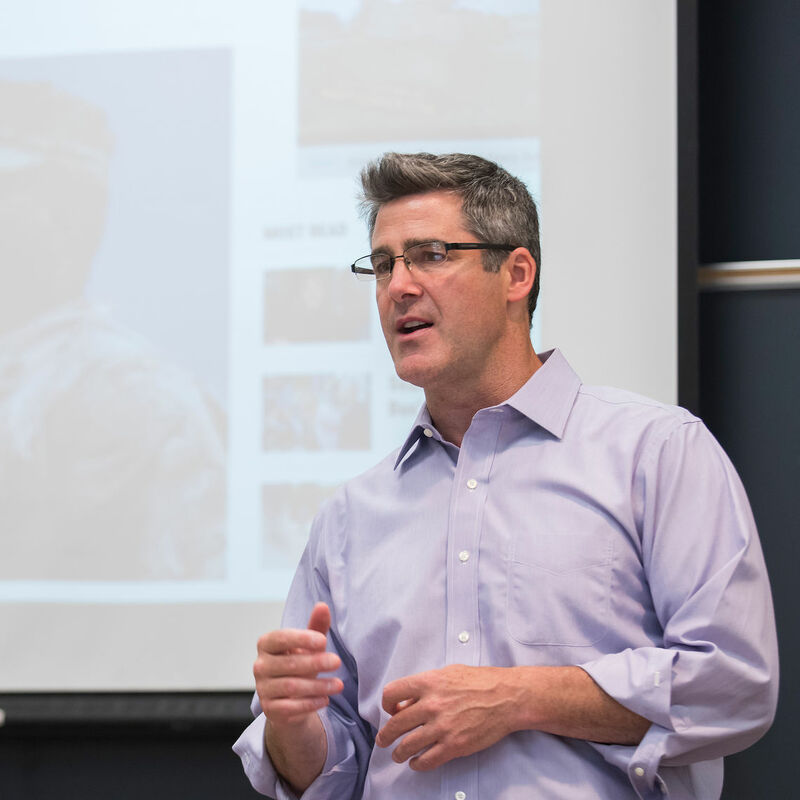 Next spring, Bryan Stinchfield (pictured) and Tim Bechtel, professor of earth and environment, will teach a class using design-thinking to address the fact that children in Lancaster have seven times the national average of lead in their bloodstreams. Stinchfield and Bechtel plan to meet with Lancaster Mayor Danene Sorace this month to gauge her interest in the project and the students’ future solution.